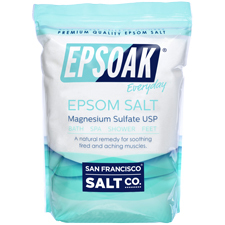 Epsoak Everyday Soothe and Calm by San Francisco Salt Company is made with premium Epsom Salt (Magnesium Sulfate) infused with essential oils known to soothe muscles, calm the mind, and promote relaxation. 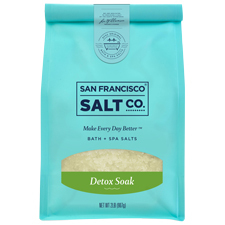 Our philosophy is simple.�We want you to remember how good it feels to take a bath.�Our products harmonize the therapeutic power of bathing, aromatherapy and Epsom Salt to transform your bath into a healing ritual for your body and mind. 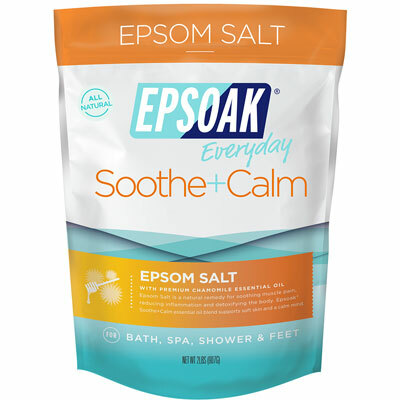 SOOTHE ACHES & PAINS:�Use Epsoak Soothe and Calm in a bath or foot bath to relieve muscle aches & pains and stiffness. The perfect evening bath after a stressful or demanding day. 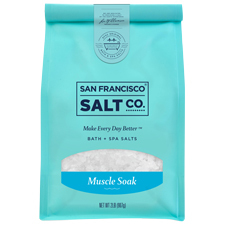 Ingredients:�Magnesium Sulfate (Epsom Salt), Aloe�Barbadensis (Aloe Vera) Leaf Juice, Tocopherol�(Vitamin E), Juniperus Virginiana (Red Cedar) Essential�Oil, Anthemis Nobilis (Roman Chamomile) Essential Oil,�Lavandula Hybrida (Lavendin) Essential Oil, Lavandula�Angustifolia (English Lavender) Essential Oil, Salvia�Sclarea (Clary Sage) Essential Oil, Vetiveria Zizanioides�(Vetiver) Essential Oil, Leptospermum Scoparium (New�Zealand Tea Tree) Essential Oil, Cera Alba (Beeswax)�Absolute.